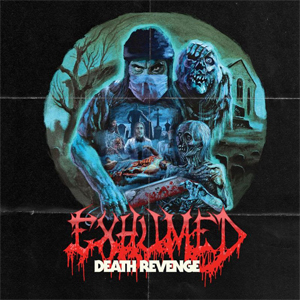 EXHUMED Shares New Video For "Lifeless"
Gore metal maniacs EXHUMED have shared the official music video for "Lifeless" off their impending new full-length album Death Revenge. Watch the horror-filled clip now on KNAC.COM HERE. Issues frontman Matt Harvey: "Following sequentially through the album's track list, we are stoked to lay "Lifeless" on you. "Defenders Of The Grave" is the introduction for the tale of Death Revenge and "Lifeless" sets the actual plot that continues for the rest of the record in motion. Fitting with the vibe of the storyline as a whole, the clip focuses more on story elements and vibe rather than close up shots of guitar-noodling. I think it sets the tone nicely. Cheers!" Listen to the previously released song "Defenders Of The Grave" below. Death Revenge is set for release on October 13th on CD, LP, deluxe LP with cassette, and digital formats via Relapse Records. Physical packages and digital order are available via Relapse.com and Bandcamp. EXHUMED recently announced a short run of live dates in November with THE BLACK DAHLIA MURDER, SUFFOCATION, DECREPIT BIRTH and more as well as a performance at Ozzfest Meets Knotfest on November 5th in San Bernardino, California. See confirmed dates below with additional live abrasions to be announced in the future.